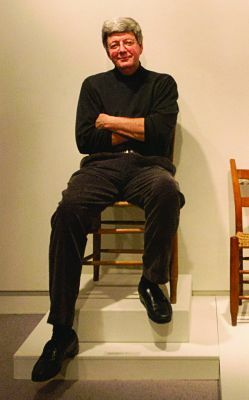 After graduating from Goshen College with an interdisciplinary major in 1963, Robert Brunk became an activist, professor, sculptor and auctioneer. How does an activist become an auctioneer? For Robert Brunk ’63, who gave up the gavel and retired this year, the journey from being a community organizer to an auctioneer has taken many twists and turns. After Brunk graduated from Goshen College, he attended the University of Michigan and became aware of a need for social change. He began working in Asheville, N.C., for the Office of Economic Development in three segregated housing projects, helping tenants resolve issues and organizing youth activities and Head Start programs. When his position was eliminated less than two years later, Brunk began a short teaching career as a professor of sociology and anthropology at the University of North Carolina Asheville. He had a no-nonsense teaching method; when called on, a student could either say: “I’m prepared for class but lost,” “I’m not prepared” or “I’m bored… and leaving.” He applied this rule to himself, and would leave mid-class if he felt that he couldn’t get his students to reach their potential. Since Brunk did not hold a postgraduate degree, he left the world of teaching and spent the next decade as a woodworker and sculptor. Because of his anthropology background and passion for beautiful handicrafts, he decided to enter the world of auctioneering. In 1983, Brunk Auctions was born. Brunk’s was one of the first auction houses to provide a written program with descriptions of the goods for sale. He later began providing a full-color catalog to buyers, and now items are listed online for the more than 15,000 regular buyers from around the world. What started as a passion 30 years ago has grown into an internationally recognized auction house specializing in paintings, furniture, silver, jewelry, folk art, rugs and myriad other antiques and fine art. When Brunk recently retired, he passed the business to his son, Andrew, who is a formally trained antiques expert and grew up watching his father in his element. And while Brunk is officially retired, he still plans to take the stage and call bids now and then as president emeritus of Brunk Auctions.